The failure of the February 23 “humanitarian aid” provocation on the Venezuelan border was a serious blow for Trump’s ongoing coup attempt. There were mutual recriminations between self-appointed Guaidó, Colombian President Duque and US Vice-President Pence. The US could not get a consensus from its own Lima Cartel allies in favour of military intervention. The coup was losing momentum. Then, on March 7, just days after Guaidó’s anti-climactic return to Caracas, the country was plunged into a nationwide blackout from which it has not yet fully recovered. What caused it? How is it related to the “regime change” attempt? And, most importantly, what are imperialism’s plans and how can they be fought? February 23 was supposed to be the coup’s D-Day. The idea was never to actually deliver “humanitarian aid” into the country, but rather to create a “people’s power” moment, where large crowds of opposition supporters on both sides of the border defied the Venezuelan armed forces, which, when faced with a large crowd of peaceful demonstrators, would then switch sides and join Trump’s puppet, Juan Guaidó. On the day, however, things did not go according to Washington’s plan. The crowds of opposition supporters did not materialise in the expected numbers. “Aid” trucks did not cross the border and by the end of the day, Rubio, Abrams and Guaidó were left with egg all over their faces. Having been defeated on February 23, the meeting of the Lima Group of countries in Bogotá the following morning was a further setback. Let us remember that the Lima Group (more accurately known as the “Lima Cartel”) is an ad-hoc group of countries created with the explicit aim of overthrowing the Venezuelan government when the US could not get enough votes at the Organisation of American States for its bellicose resolutions. Before the meeting even started, there were public statements by Chile, Brazil and Paraguay explicitly ruling out military intervention. The case of Brazil is noteworthy because there is a major split within Bolsonaro’s cabinet, and between him and the Armed Forces. Under pressure from the generals and his own vice-president, General Hamilton Mourão, the far-right president has been forced to retreat from several of his public statements, specifically, support for the transfer of the Brazilian embassy to Jerusalem and granting the US army access to a military base in Brazil. When the Lima Group decided in January to cut off all contact with the Venezuelan armed forces, the Brazilians kept communication lines open. The Brazilian army went as far as vetoing the presence of US soldiers in the border with Venezuela as part of the so-called “humanitarian aid” operation on 23 February. Faced with such reluctance, the Bogotá meeting on 25 February ended with a statement that used strong words of condemnation and issued unspecified threats, but did not contain any serious commitment to the next steps in the “regime change” operation. The US announced the inclusion of a few more Venezuelan officials on their sanctions list, including four regional governors. Hardly the “military intervention now” that the opposition demanded. Media reports have talked of recriminations from Mike Pence (who had cut off his trip to South Korea to attend the meeting) to Guaidó. 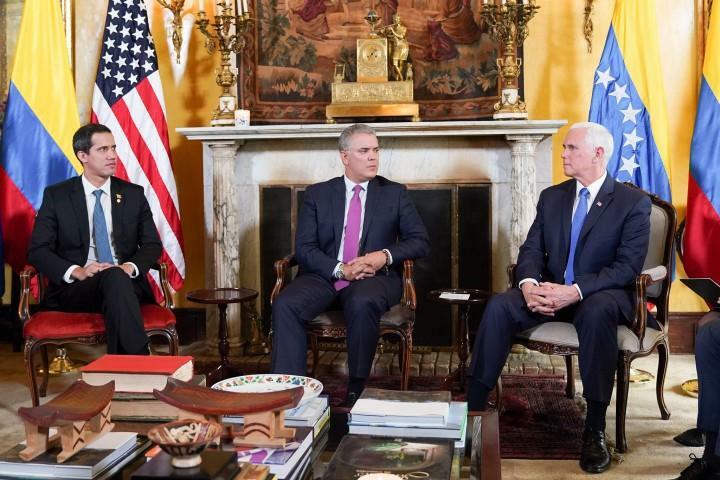 According to one report, Pence told Guaidó that “everything was failing in the offensive against the chavista regime, the biggest complaint was because of the continued loyalty of the armed forces to Maduro." Apparently, Guaidó had promised the US that if they were to get “the main world leaders to recognise him… at least half of the high ranking officers would defect. It didn’t happen." The other main criticism was regarding the Venezuelan opposition’s appraisal that Maduro’s “social base had disintegrated. The crisis revealed that support for the government has in fact diminished, but is not inexistent”. The hawks in Trump’s administration – Bolton, Pompeo and Abrams – made a series of fatal miscalculations. First, they assumed Maduro had no support whatsoever, underestimating the strength of anti-imperialist feeling in the face of a brazen US coup attempt, and the fact that, while support for Chavismo has diminished, it still managed to get over 30 percent of the census to vote for Maduro a year ago. Moreover, in the last few weeks, there has been a series of impressive, anti-imperialist mass rallies led by Diosdado Cabello in all states in the country. Second, they thought that the opposition was able to mobilise large numbers of people who are prepared to go all the way in an open clash with the government. In fact, the opposition ranks, having been betrayed by their own leaders in 2017 and defeated in their previous attempts in 2013 and 2014, are distrustful of the opposition leaders and sceptical about their own ability to remove the government they hate. They have put all their illusions and hopes in a US-led military intervention and that is a state of mind which can produce a large rally (for instance on January 23) but not a sustained mobilisation to overthrow Maduro. The failure of February 23 furthermore left Guaidó abroad, in Colombia. He thought he would come back victorious, at the head of a US convoy of “humanitarian aid," but found himself having violated a court order not to leave the country and stranded in Bogotá. He started a short tour of Latin America, on board a Colombian plane, but soon the US called him to order. He discarded a plan to continue his tour in Europe and was told in no uncertain terms that he had to return to Venezuela as “he was losing momentum." Again, Abrams, Bolton and Rubio attempted to build up Guaidó’s return as another D-Day, baiting Maduro to arrest him on arrival in order to build a casus belli for foreign intervention. It resulted in another flop. Guaidó returned on March 4, the assembled EU ambassadors received him at the airport and then he went to a rally in the east of Caracas… But to his disappointment and that of his minders in the US, he was not arrested (although he should have been arrested, there were plenty of reasons to do so). Then came the blackout. Starting on Thursday, March 7, just before 5pm, a major power failure affected 18 out of the country’s 23 states and the Capital District. In Caracas, the Metro stopped working and tens of thousands had to walk their way home, in the dark. After a few hours it became clear that this was a major incident and power would not be restored quickly. The government decreed Friday a national holiday. The situation is serious. The government decreed another holiday for March 11 and 12. Back-up electricity generators keep power supply to essential installations, like hospitals, but there are serious problems with public transport. Shops do not accept card payments and many have increased prices and resorted to only accepting payment in dollars. There are also problems with the water supply, telecommunications (phone and internet) are very intermittent, and food stored in fridges and freezers risks being lost, etc. The government’s claim is that there was a cyberattack against the system that controls the El Guri turbines and regulates power generation and supply down the 765KV line to Malena. The government has also declared that, when power was restored on Saturday, March 9, there was another such attack, and that these attacks have been carried out by US imperialism. For those tempted to dismiss these accusations as a “conspiracy theory," let us look at the following facts. First, the US and the mass media blatantly lied about the burning of the “aid” truck just two weeks ago. Furthermore, what credibility has Marco Rubio got? On March 10, he tweeted there had been an explosion at a “German Dam," when in reality a Venezuelan opposition journalist by the name of Germán Dam had reported an explosion at a power substation. In an even more callous twist, Rubio “reported” 80 babies having died at a hospital in Maracaibo due to the blackout, only to be corrected by the chief of the Wall Street Journal South America Bureau: the hospital had recorded no neonatal deaths. None. Zero. Ninguna. Why should we believe anythingthese people say? “In the case of Venezuela, the idea of a government like the United States remotely interfering with its power grid is actually quite realistic... Given the U.S. government's longstanding concern with Venezuela’s government, it is likely that the U.S. already maintains a deep presence within the country's national infrastructure grid, making it relatively straightforward to interfere with grid operations. The country’s outdated internet and power infrastructure present few formidable challenges to such operations and make it relatively easy to remove any traces of foreign intervention. Widespread power and connectivity outages like the one Venezuela experienced last week are also straight from the modern cyber playbook” [my emphasis]. While the article in the end says a different scenario is highly likely, it nevertheless highlights “the inability to definitively discount U.S. or other foreign intervention." Finally, the more recent US sanctions on PDVSA have prevented Venezuela from importing and producing the fuel needed for the thermoelectric plants that should have provided a back up when El Guri Hydro went down. The situation in Venezuela depends greatly on factors that are developing behind the scenes. It is impossible to say what is actually happening in the military barracks and in the officers’ quarters. 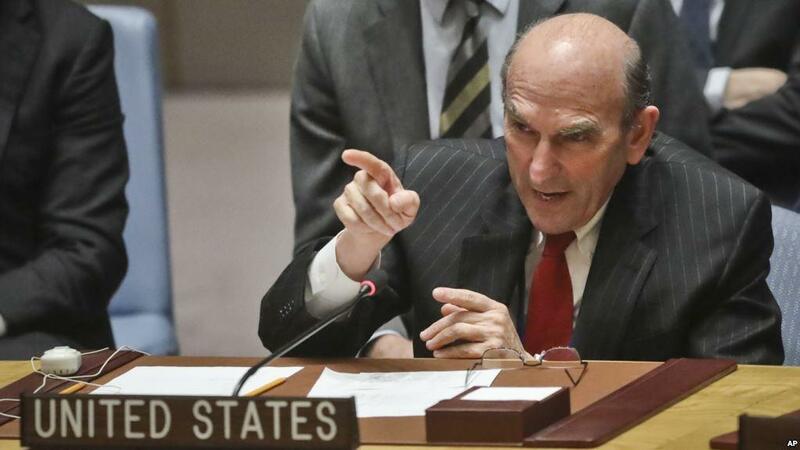 The whole policy of US imperialism is designed to put pressure on them, by making the situation in the country unbearable, so that the generals perhaps draw the conclusion that their interests might be best served by removing Maduro from power. This is achieved by sanctions designed to hurt the economy. The latest development on this front are the threats issued by Bolton and Abrams to punish, not only US companies trading with PDVSA or the Venezuelan government, but also financial institutions in third countries. The aim is clear: to completely strangle the Venezuelan economy until it chokes the government into giving up. This is a criminal policy that is hurting the poor and workers of Venezuela first and foremost, completely discrediting the idea that Washington is at all concerned about an alleged “humanitarian crisis." As for the possibility of military intervention, it is clear that the US would like Latin American countries to front it, but there is no appetite in the Lima Group for military adventures, which can prove costly and damaging. That leaves the US with very few options, the main one being to increase the pressure, through sanctions, sabotage, provocations, etc. This much was admitted by Elliot Abrams in a conversation with two Russian pranksterswhen he thought he was talking to the Swiss president. He said: "We think it is a mistake tactically to give them endless reassurances that there will never be American military action. But I can tell you this is not what we are doing. What we are doing is exactly what you see, financial pressure, economic pressure, diplomatic pressure."